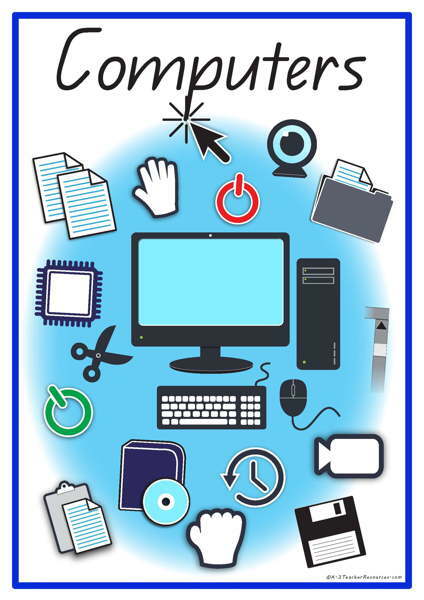 42 printable computer vocabulary words and pictures. Ideal for classroom, school, computer lab display and reference. Vocabulary words – Ideal for display and reference particularly in computer lab. Use as base for ‘word play‘ activities. Make mini copies of these words for children to become ‘word detectives’ and play with the laminated words – circling, colouring phonics etc. These smaller sizes are also great for cut and paste activities such as cutting out the words and pasting them in alphabetical order. When not being used on a wall display, place them in labelled boxes (small wash powder boxes or yoghurt containers work well, or hanging pockets for continued ‘grab and go’ games and writing reference.